The family Zingiberaceae is known for beautiful, and often bizarre flowers as well as rhizomes. The family is most well known for Zingiber officale (Common Ginger), Cardamom, and Curcuma longa (Tumeric) among many other culinary and medicinal plants. The focus of this article, however will be Hedychium coronarium (White Ginger Lily or White Butterfly Ginger). If you are looking for an easy to grow perennial flower with a number of other uses, look no farther than the White Butterfly Ginger! This exotic flower is a great way to bring beauty and fragrance to any tropical garden or greenhouse. The rhizomes have some medicinal value but it is the flowers that are the true reward of growing this plant. The flower buds can be eaten or put in hot tea to infuse flavor and fragrance. 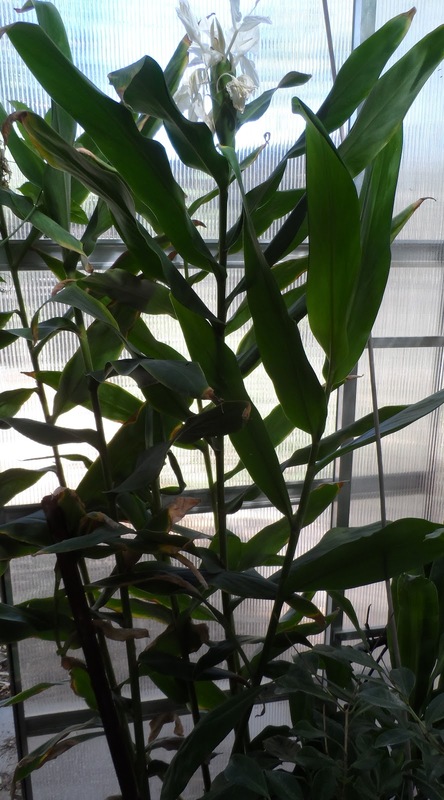 Growing White Butterfly Ginger is easy especially if you can get a rhizome. If you live in the U.S. it might be best to look on the internet for the rhizomes. The Butterfly Ginger can survive mild winters as it is a perennial and it prefers warm and moist tropical conditions. In my greenhouse it blooms when summer temperatures decrease in August.